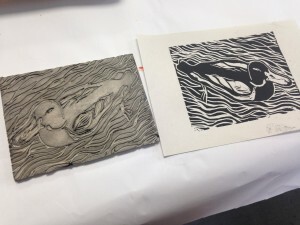 I love working in the soft linoblock to find my duck. 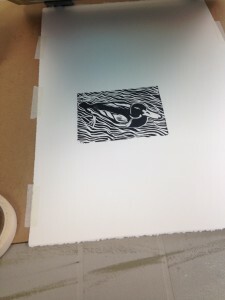 A block is a piece of wood, linoleum or styrofoam used as a matrix for a print. 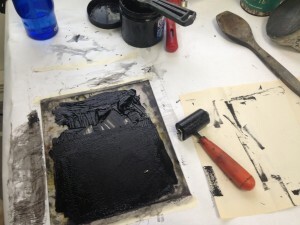 Ink, a mixture of pigment suspended in a water-soluable base with gum arabic, is used for block and Collagraph printing. 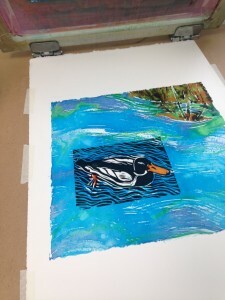 The ink is applied to the block with a brayer, the block is flipped and positioned on the paper and then a baren or spoon or even just your thumb is used to press the paper into the block to transfer the ink. I’ve got a dry print of my duck, centered it and taped it under the screen. 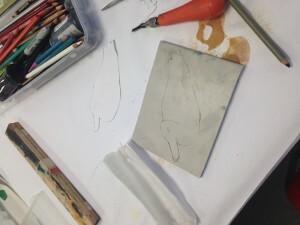 In many of my prints I make a block print (take a look at my duck) and then a monoprint over it. By adding the monoprint over the block print I’ve make each one unique. These are numbered with “V.E.”, meaning various editions. I learned this technique in a program with Linda Kirstin Blix. You can find her at her website. You can see that I didn’t paint my screen where the duck would be, and I did this loosely because I like the effect of not having a tight image. 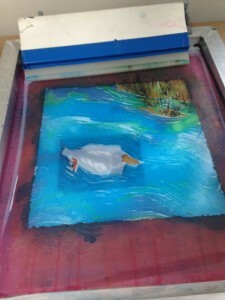 The areas left unpainted on the screen will be the white of the paper on the finished print. Those clear areas also allow the black ink of the underlay print to remain crisp. I’ve pulled the monoprint, in this case fabric dye painted on the silk screen, over a print I did in ink of my duck linocut. You can see that I masked off the shape of the duck before pulling the print.